Imhotep lived over 4600 years ago and was the highest official in Egypt during the rule of King Netjerkhet (also known as Djoser). This King ruled Kemet from around 2686 BCE and was the first ruler of what we now call ‘Dynasty 3’. Imhotep was also said to be the architect of the King’s burial monument, which was in the form of a stepped pyramid. This was the world’s first monumental stone building and was situated at the site we now call Saqqara in northern Egypt/Kemet. 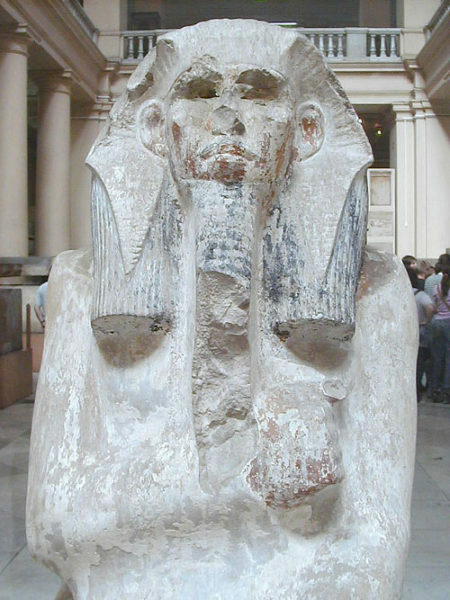 Statue of King Netjerkhet, The Egyptian Museum Cairo. This particular statue of the King shows the dark brown pigment used to represent his skin and also the bulk of his African-type hair, over which he wears a headdress. 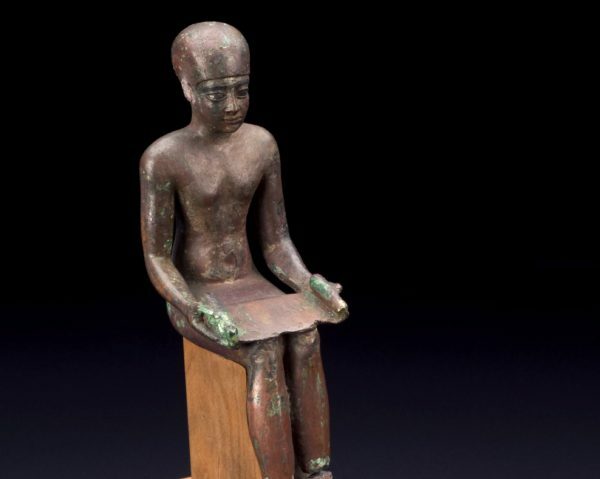 Imhotep was deified over 2000 years after his death. For a mortal to become a god was highly unusual in ancient Kemet. Kings were divine on account of their office and so were different to non-royal people. Most images of Imhotep as a god date to the Late period, around 600-30 BCE. He is shown wearing a cap and holding a papyrus role, on which the ancient Kemites wrote. It was the Greeks who identified Imhotep with their god of medicine and so many years after his death he took on this additional role. Most of the small copper alloy figures that represent Imhotep were dedicated at sanctuaries by visitors. Imhotep was worshiped at the Ptolemaic period temple below, which is at the much earlier site of Deir el Medina, or the workman’s village. This was where the tomb builders on the West Bank of Thebes lived and were buried. The photo below shows the house foundations (right) and the mud-brick temple (centre-left). In addition to Imhotep another, later, architect Amenhotep son of Hapu was also worshipped at the site, along with the two main deities Hathor and Maat. 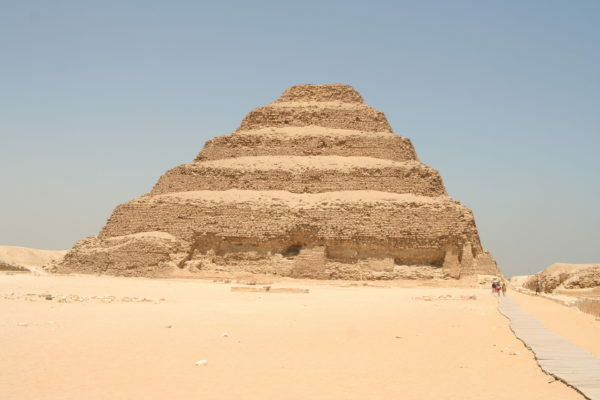 Another cult centre developed at Saqqara, where Imhotep had designed his famous pyramid. Here, visitors would dedicate animal mummies in the form of an Ibis bird in honour of Imhotep the god. 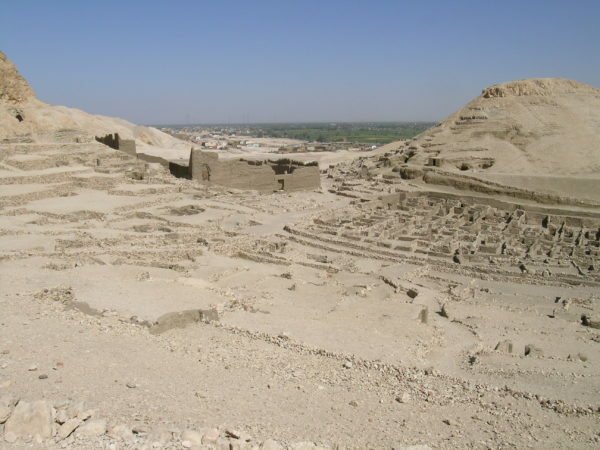 It has long been assumed that Imhotep himself was buried somewhere at Saqqara because of his position and status. His tomb has never been found in spite of archaeologists working all over this extensive site. I often hear Imhotep referred to as a ‘Nubian’, he was in fact a Kemite who lived in the northern region of the country. I have written before about the importance of acknowledging Kemet and its people as indigenous Africans. His achievement in designing and overseeing the construction of a monument such as the step pyramid is impressive and is testimony to the advanced skills of the people of Kemet.